On February 9, 2019, Elizabeth (Betsy) O’Leary Abelson died tragically in a snowmobiling accident in Greenwood, Maine. She was 30 years old. Betsy was due to give birth in March to daughter Brooke Betsy Abelson, who also passed away in the accident. Betsy was born on Oct. 10, 1988, in Concord, New Hampshire, to Cindy and Michael O’Leary. She and her siblings, James and Charlotte, grew up in Holderness, New Hampshire, on Squam Lake. She attended Holderness Central School and Holderness School and then went on to earn a bachelor’s degree in athletic training from the University of New Hampshire and a doctorate in physical therapy from Elon University. She worked as a physical therapist at Harmeling Physical Therapy and Spaulding Rehabilitation Hospital Boston where she was an inspiration to her patients with her warm bedside manner and motivating approach. On November 23, 2017, Betsy married Stuart Bradley Abelson in a beachside ceremony in Mexico and later hosted a celebration for family and friends in Maine. Betsy, together with Stuart and his two children, Audrey and Sam, really worked as a team. Betsy was the undisputed rock of the family and took pride in deftly managing the complex logistics of their busy lives. In doing so, she helped her family focus on the things that mattered most — spending time with loved ones, recognizing the beauty in and significance of small moments, and sharing their lives with others. Betsy loved being with her extended family, too, radiating her signature warmth and savoring the moments at gatherings and special events. Betsy was an avid outdoorswoman and athlete throughout her life, finding both excitement and peace in outdoor pursuits. 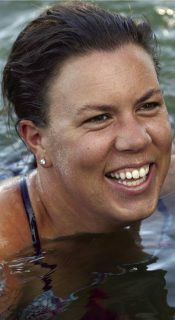 She grew up playing ice hockey and fishing, waterskiing and driving boats on Squam Lake. She also rowed crew in college. As an adult, she adored snowmobiling, snowshoeing and skiing, and she was a beloved part of the extended Sunday River and Gould Academy Alpine Program families. In the warmer months, she was most at home in and on the water, whether kayaking, water skiing, snorkeling, or stand-up paddle boarding. Her adventurous spirit and love for the outdoors merged as she delighted in small aircraft adventures with her husband and time on her family’s boat as a member of Eastern Point Yacht Club. She also became an avid golfer and belonged to the Turner Hill Club. Betsy believed deeply in helping others, whether serving on a non-profit board or including Audrey and Sam’s teammates and friends in carpools. Her volunteer leadership positions included co-chairing Wellspring House’s annual luncheon and serving as a trustee of Sunday River’s River Fund, an organization supporting local youths through education and recreation. This winter, Betsy was appointed by Massachusetts Governor Charlie Baker to the board of Allied Health which oversees clinical licensure, practice standards and excellence in the health services field. She was also a talented lacrosse coach with Cape Ann Youth Lacrosse and her players thrived under her skilled and supportive leadership. Furthermore, as an integral member of the Brookwood School community for many years, she served as the Parents’ Association Art Committee chair and as a gracious host for multiple parent gatherings and events. Above all, Betsy was best known for her deeply generous spirit. She was genuine, warm and vibrant, and her ability to connect with candor and down-to-earth interest made others feel welcome and included, no matter the setting. She was both an anchor and an energizer, and she inspired those whom she touched with her earnest presence and deep commitment to helping Audrey and Sam grow and thrive and to do what is good and right. In addition to her husband, Stuart, Betsy is survived by two stepchildren, Audrey and Sam of Gloucester, Massachusetts; parents Cindy and Michael O’Leary of Holderness, New Hampshire; brother James O’Leary of Holderness, New Hampshire; sister Charlotte O’Leary of Holderness, New Hampshire; grandmother Barbara O’Leary of Winchester, Massachusetts; grandparents Barbara and Peter Gibb of Bedford, Massachusetts (formerly Weston, Massachusetts); parents-in-law Annalee and Mark Abelson of Holderness, New Hampshire; brother and sister-in-law Richard and Mariana Abelson of Gilbert, Arizona; nephew and niece Jake and Alexia of Gilbert, Arizona; and many beloved aunts, uncles, and cousins. A celebration of Betsy and Brooke will be held next week at the Barn on the Pemi in Plymouth, New Hampshire. For information related to the celebration date and time, please visit mayhewfuneralhomes.com, as details are still being finalized. In lieu of flowers, donations may be made to the Betsy and Brooke O’Leary Abelson Charitable Trust at gofundme.com/betsy-and-brooke which will meaningfully support the organizations and causes that were most important to Betsy and her family.